That very day, Flatley went to the officer selection office and asked to go to officer candidate school for the Marine Corps. “And my career in the Marines has taken me places that are phenomenal,” she says. 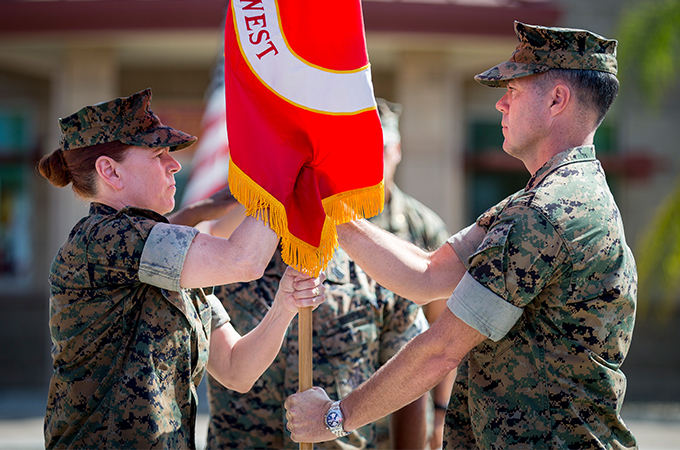 Two decades later, thanks to her work around the world within the Navy and Marine Corps, Lt. Col. Flatley has been named commanding officer of the Marine Corps’ Wounded Warrior Battalion (West) at Camp Pendleton. Just 12 percent of those eligible are selected as commanding officers. The Wounded Warrior Battalion at Camp Pendleton facilitates the non-medical and medical care of both combat and non-combat personnel. Her staff includes recovery care coordinators, case managers, psychologists, medical officers, coaches, athletic trainers, and others, who focus on the needs of the mind, body, spirit, and family. “We have a whole team assigned to each wounded, ill, or injured Marine or Sailor,” says Flatley. “We provide services to help individuals either recover and go back to their unit or transition to the civilian sector.” The battalion provides support with finding civilian jobs and pursuing an education. Flatley’s own education helped chart her career: “I decided to go to Redlands because it was smaller and more personable, and I wanted to play basketball and softball and run cross country,” she says. Before enrolling at U of R’s College of Arts and Sciences, she had served in the Navy for eight years, as well as living in Argentina while on a mission with the Church of Jesus Christ of Latter-day Saints. “I found I had an ease with speaking Spanish, so I decided to study it in college,” she says. “I also learned a lot about myself and about leadership while at Redlands.” Having completed officer candidate school the previous summer, she became a commissioned officer in the Marines the day she graduated from Redlands. During her 22 years in the Marines, Flatley earned a Master of Arts in Education Instruction from Central Michigan University, and she has served in a variety of service and leadership positions across the nation and around the world, including a 13-month deployment in Iraq in from 2008 to 2009. She then moved to Madrid to study strategic and tactical war planning—programs taught in Spanish alongside military members from NATO and non-NATO nations. To read more about U of R’s alumni, go to the Alumni Stories web page.